These creatures look cute and lively. They are the close cousins of chipmunk and groundhogs. But don’t be fooled by their looks. 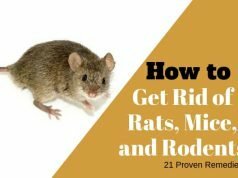 They are rodents and can create havoc in your attic and yard. Do you know whom we are talking about? Yes! We are talking about squirrels. Squirrels belong to the Sciuridae family which includes medium-sized animals. They are extremely intelligent and can put on a deceiving behavior to fool the onlooker. They are known to bury fake food to deceive nut thieves like birds and other squirrels. Many people think squirrels collect nuts and acorns and only feed on them. That isn’t the case. These nimble rodents are omnivores. They feed on fungi in your yard, seeds, eggs, small insects, caterpillars, small animals, bulbs, berries and fruits in your yard. They are voracious eaters. Squirrels can eat up to their own body weight in a week. They prepare for cold months by burying their food to store, so they can feed on them when the supply is scarce. Squirrels destroy the garden and make unsightly burrows, turning the garden bed inside out. 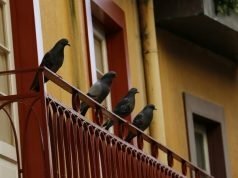 That is not all, squirrel feces and urine are known to be one of the leading sources of the deadly salmonella virus. They carry ticks, fleas, mites and spread them around in your garden, shed, roof, yard, and other places. 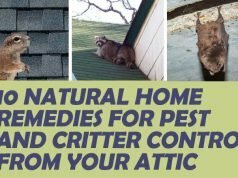 Some make it into your attic, ruining it and infesting with bugs and mites. Flying squirrels – Found in the temperate regions in the northern hemisphere. California ground squirrels – They have white fur surrounding the eye region and the rest of the body is mottled with brown, yellow and grey hairs. Western grey squirrels – Found in and around California USA. Grey squirrels – Predominantly in places in around the United States and Canada. Irrespective of the species, squirrels are rodents and they are carriers of dangerous diseases. Squirrels give birth to young ones twice a year. They communicate with each other making clucking sounds. The shrill squirrel sounds you hear is their mating call. They also use their tails to send out signals of danger and alert other fellow squirrels. Squirrels reproduce and give birth to 2-8 babies twice a year. Female squirrels carry their young ones in their wombs for 20 – 65 days depending on their species. The babies are hairless and born blind. Squirrel babies are called kits or kittens. The mother takes care of the young ones for three months until they are ready to forage for food themselves. It is interesting to know that squirrels have 4 teeth in front of their mouth which grow throughout their lives. Squirrels nest in notches, dens and tree holes. Unlike other squirrels, the common grey ones do not hibernate during winter. They seek refuge indoors. Squirrels are aggressive. They mob small pets like cats who come out in search of nuts. Squirrels are carriers of the infectious squirrel-pox, a family of small-pox and chicken-pox virus. Although spreading this virus is uncommon to humans, they infect other squirrels. Most squirrels in the wild are known to die of squirrel-pox rather than starvation. Squirrels are good climbers and jumpers. They hop from tree to tree and into your homes. They seek refuge comfortably in your attic. There are a number of things that you can do to keep squirrels out of your home and yard. How To Get Squirrels Out Of My Attic? Got Squirrels In The Attic? Don’t worry, there’s help. Squirrels cannot stand acidic and pungent smells. Pour some apple cider vinegar into a bottle and generously spray it in and around your attic to eliminate squirrels in your attic. Spray it on stacked boxes, clothes, pots and pans and every crevice in your attic. The annoying mangy creatures will not return. You can alternatively add a little spice of jalapeño pepper into your vinegar spray bottle and then spray away. The combination of pungent pepper and acidic vinegar will work wonders. Don’t place squirrel traps or squirrel poison in your attic because dead squirrels will stink up the place and spread more diseases sooner than you know. Attics are sealed and don’t have ventilation so the disease germs from dead animals will spread in the attic making things worse for you. How to scare away squirrels? Scare squirrels off with water. Get water sprinklers with motion detectors in them. The moment any kind of motion is detected by the sensor, the sprinklers turn on, and stop as soon as they sense inactivity. Have a squirrel dog for a pet. It would be very entertaining for your pet. Dogs love to play chase. Many breeds of dogs devour squirrels. This should take care of your squirrel problem. Squirrels are the primary diet for snakes. Place rubber snakes near the bushes and around the places most visited by squirrels. This is the safest and easiest way to keep those squirrels away from your garden. This is yet another convenient and hassle-free way to get rid of squirrels. Rodents like squirrels can hear sounds at much higher frequencies than humans. It may be inaudible to our ears, but the high frequency is intolerable to squirrels and other pests in and around your house. They will stay away from your premise. 5. How to trap a squirrel? Near the bird feeder where they visit the most. 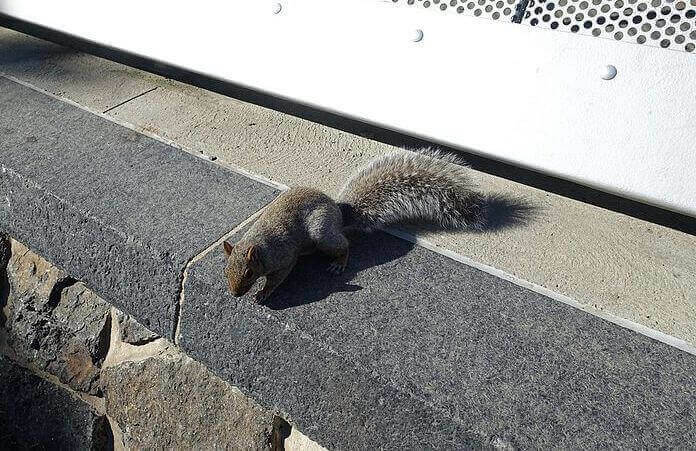 Squirrels prefer outdoor open spaces. Keep them away from bushy plants or shrubs. No food – no squirrels. Don’t make food available to them. Avoid hanging the bird feeder on a tree. Hang them on a pole away from the trees. You may also wind the pole with spiky squirrel guards to protect the feeder. Squirrels don’t like the feel of soft wet mulch. They also detest the smell of redwood mulch. Mulch your flower beds and bulbs. They will stop visiting the place. The smell of mint is relaxing and appetizing to humans. But, it is just the opposite for squirrels. They find the smells of herbs like mint obnoxious and repelling. Mix safflower seeds in the bird feeder or buy ready-made seeds with a combination of safflower seeds. Squirrels find the bitter taste of safflower seeds distasteful. Once they stop getting the food of their liking, they will have to relocate elsewhere in search of palatable food. Squirrels cannot withstand the acidic smell of citrus fruit peels like lemons and oranges. They may love your fruits but, certainly cannot stand the smell of composting fruits. Place a small amount of composting fruits or citrus fruit peels around your yard and places that squirrels frequently. Squirrels love the smell of peanut butter. They will at once eat them. However, aspirin is poisonous to squirrels. On feeding on the mixture, the squirrels start feeling suffocated and leave the place to look for open spaces and fields to try to get some fresh air and eventually die away from your house and yard. Ammonia has a distinct pungent smell. It causes discomfort to almost all animals, and squirrels are no exception. It is an effective way to keep squirrels away. Soak a few rags in ammonia. Repeat it every day till the squirrels find another place. This works well for getting rid of squirrels in the attic as well. Spices are good squirrel deterrents. Take equal portions of nutmeg and cinnamon powder. Mix them well and sprinkle them liberally in places frequented by the squirrels. To avoid the wind carrying away the fine powder, sprinkle them on wet soil or damp surfaces. The moisture will hold the powder for long. Repeat as and when needed. The strong smell of naphthalene in the mothballs not only deters moths and keeps your closets safe, but also repels squirrels. Place a few in the yard and your flower beds and nerdy bushes. Mothballs work well in the attic too. Replace them frequently. The soothing fragrance of peppermint mint oil is relaxing to humans but, to squirrels they are intolerable. Soak a few cotton balls with peppermint oil and leave them around areas the squirrels visit. Squirrels can climb anything. They don’t spare any high spot – your pipes, trees, walls and any kind of fence. They have sharp teeth and can nibble a standard wire mesh too. The best way is to get a low voltage electric fence. This will keep the squirrels and other rodents out of your yard. Be warned, not just Santa, but also squirrels can climb down the chimney to your house. Don’t worry about Santa, he knows his way around but a squirrel in the chimney is like a kid in a candy shop. Cap your chimneys and seal the squirrel entry points to control them from entering your home and attic. Squirrels love to feed on berries. They jump all over the bushes, drop, squish the berries and make a mess. Consider netting those bushes. Be sure to choose a high-quality metallic mesh to prevent the squirrels from gnawing through the nets. Squirrels can be quite stubborn. They can pry open loosely placed lids of a trash can in search of food and make a mess. Make sure to buy a sealable trash can and secure the lids properly. It may be a slightly expensive option, but it’s a great way to protect your fruit and vegetable garden. Consider building a greenhouse. You can sleep in peace and not worry about these pesky rodents destroying your produce. Squirrels gather thousands of nuts and bury them in the yard. They, however, forget where they have buried them and start digging the ground to look for them. That is the reason your gardens are turned inside out during the winter and fall.